Last week, we kicked off the summer with our first trip. To the beach, naturally! We really wanted Cosmo to get a chance to go to a dog-friendly beach, after visiting Tybee Island. I first found out about Topsail Island several weeks ago while talking to fellow dog owners. 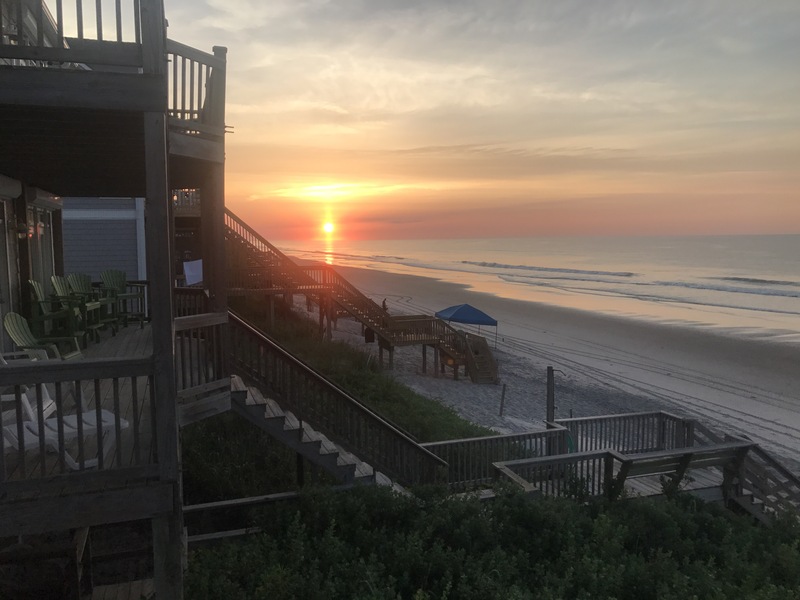 Topsail (pronounced like Top-sel), was described as an up-and-coming, just-starting-to-get noticed dog-friendly beach area. Unfortunately, Cosmo fractured his wrist a week before our trip. So he had a splint and an annoying cover he had to wear whenever I let him hop along the beach for a few minutes (he was instructed to take it easy and keep his cast dry and clean). I originally did a search for houses at Rentabeach.com. It was a good site for it’s usability, but may not be that reliable. Their bookings are not always up to date. I thought a different house I considered was available and that our request had gone through, but when I called the actual rental agency, Topsail Realty, there was no record of it. So use the site with caution. 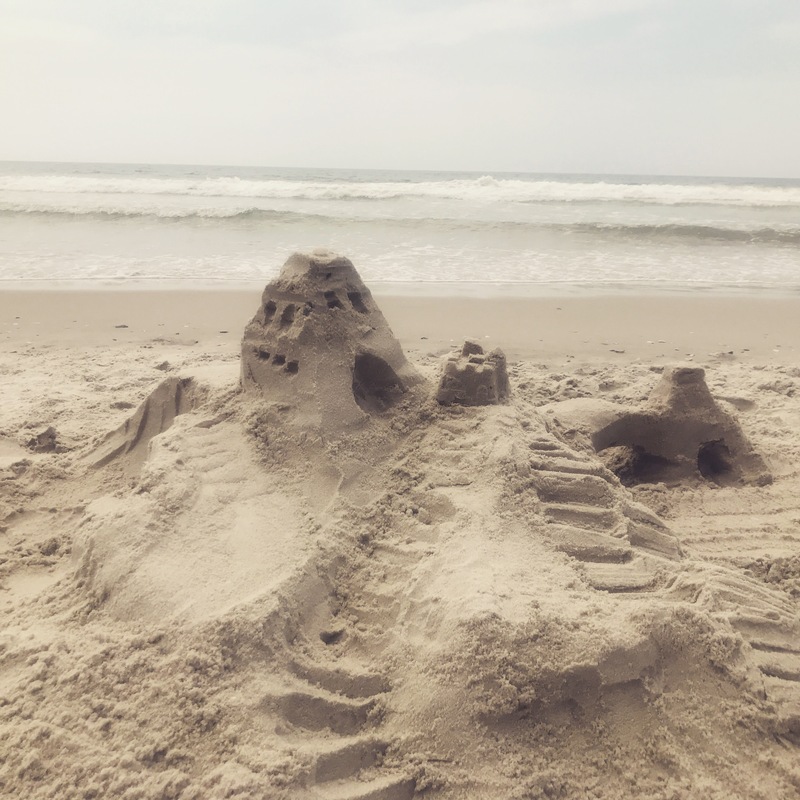 I ended up finding Sand Sational through Topsail Realty’s website and they have been great to work with. Sand Sational is a 4 bedroom oceanfront beach house. It was so spacious…we shared part of the week with another friend, her 2 kids, and her dog. The kids had plenty of space to play and run around, while we still had space to relax in relative calm. Some aspects of the house could use updating (I never managed to get the full bath showers to work and the vertical blinds kept falling off). The kids were waking up before sunset around 5:30 am. Next time, I will bring darker window treatments with me. It’ll be worth it for my sanity/sleep. This house is as oceanfront as you could get. 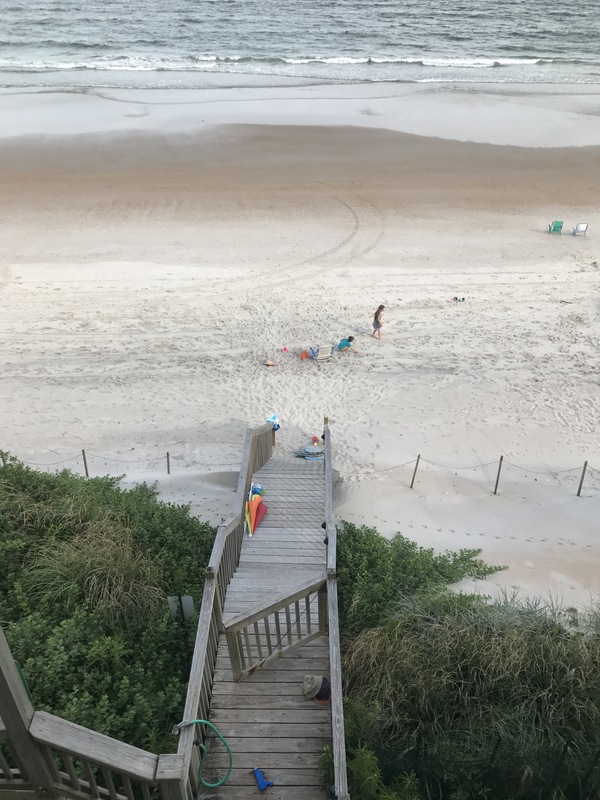 At high tide, our stairs are a handful of steps away from the water. The beach is wide and shallow, with little pools forming at lower tide. It’s the perfect beach for kids to play and dogs to run in the water. I was able to let the kids play on the beach on their own (no Papa this time) while I cooked dinner. Cosmo whine-barked at me from the house when he would see me go in the waves. Philippe called me from the house while I was out swimming to tell me he was hungry. I was literally floating around out past the waves and could hear him from our deck telling me he was hungry. Can’t get much better than that! I would pick this place again in a heartbeat. For this trip, I found a local grocery service that does all the shopping and stocks the kitchen before our arrival. Lawhon Enterprises did a great job picking out produce (which is always my concern with using services like these) and thoughtfully set up the groceries in the fridge and pantry. They passed the ultimate test (in retrospect) and even managed to pick out perfect avocados and tomatoes. After driving about 7 hours straight with 2 kids and a dog, the last thing I wanted to worry about was food and having to get groceries for the next morning. There’s a fee for the service -$50 and 15% of the grocery bill, which to me was priceless. Our house came with complimentary spectator passes for the Jolly Roger Pier and the Surf City Pier (otherwise, it’s a dollar per person). There are some fishermen along the long piers so I guess people are supposed to be spectating? Because the only thing more fun than fishing is watching other people fishing…. Snooooooze. Anyway, the piers were cute and made for some cool photos underneath. Otherwise, they weren’t anything to write home about. The Surf City Pier has ice cream and a little shop. There are not many activities, so bring things along. Our house had some puzzles, games, dvds, books, and several smart TVs. It does seem like the town is starting to get more built up. There are a few little shopping plazas on the main road in and grocery stores are easy to find. I did find one particularly noteworthy place that just opened up-a burger and poutine joint called Spudee’s. The owners are actually French-Canadian. So of course I had to stop and order both their signature poutine (the classic with curds and gravy) and the the seafood one (with creamy sauce, scallops, crab, and shrimp). My advice-stick with their signature, classic poutine. There are a couple little playgrounds down Shore Drive, a children’s museum, a mini-golf place, and a turtle sanctuary, none of which we checked out. Well, we checked out one playground and the kids lasted all of 5 minutes before they were hot (none of the playgrounds seemed to have shade) and bored. We (mostly me) were too busy building sandcastles and playing with friends to go too many places. Every great sandcastle builder had to start somewhere, right? !